Shakespeare's tale of shipwrecked twins was Tumbleweed's choice for their 2008 Shakespeare in the Park production. 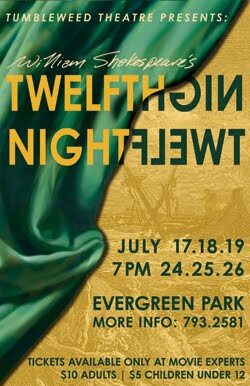 Twelfth Night brought a return to comedy for the Tumbleweed cast, helmed by director Rob Brown. Bright colours for the set and costumes complimented the "always live" mindset of the 2008 production. "We tried to capture a lot of spontaneity and discovery of the rehersal process and keep it all the way to the final curtain of the final show," said Brown.